Every so often, we highlight the importance of student scholarships by introducing you to the very students they help to succeed. 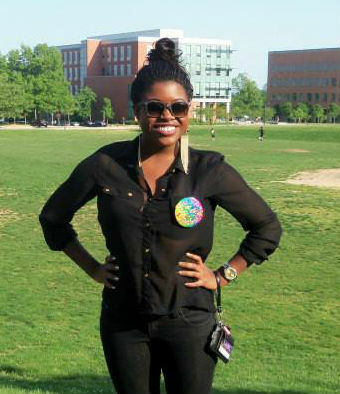 Today, we’re featuring Bria Hamlet ‘15, who is an Alumni Association Scholarship recipient. My decision to attend UMBC was not an easy one, as I initially had my heart set on going out of state for college. I quickly learned that UMBC was not only a great place to study, but a perfect fit for me. I love being a Retriever and making the most of every day on campus. I fell in love with our school spirit, academic strength, and comfortable community. I can honestly say I would not want to be anywhere else. The most amazing discovery I’ve made so far as a student at UMBC is my sense of unity with my fellow students. We’re all in this together, whether it’s overcoming our hefty workloads or bonding over a power outage on campus. I feel very at home here and hope many other students feel the same. I have been a Peer Health Educator through University Health Services for three semesters. I am quickly approaching my fourth and final semester, as I am aging out. This program has really shaped both my experience at UMBC, but also my career aspirations and goals. I LOVE health education. I love helping other students feel empowered to take care of themselves, but also understand risk and make informed decisions. We put a lot of time and effort into creating fun and engaging programs for our classmates; we would not show them anything we wouldn’t sit through ourselves. I take so much pride in being a part of this amazing, elite group of students and I am grateful for every moment spent with them. Right before I chose a college, my parents and I had the talk about making wise financial choices. While there was never any doubt that I was destined to attend college, my parents had the foresight to avoid mountains of debt through going out-of-state. My decision to attend UMBC was the smartest choice financially, but that did not mean there were not struggles. I still have loans, I still worry about how I’m going to pay for graduate school, and I wonder why it costs so much to help people grow scholastically. However, this scholarship support shows me that there are great people out there who want me, as well as other students, to [succeed] too! It’s a great feeling and I plan to pay it forward someday. I am very, very proud of the work I put into building my GPA this past school year. Out of 10 classes, I received A’s in eight. I have always been studious, but I hit bumps in the road that no longer made my GPA a reflection of me. I have worked hard to pull it up, and will continue to do so in my final semesters here. Thank you so much for seeing in me a student worthy of your support and kindness. I have never received a scholarship before and I am thrilled that you changed that for me. I will try my hardest to make you proud, and represent your alma mater in the best way I possibly can. I plan to attend graduate school to obtain my Masters in public health. Afterwards I will gain my PhD in population, family and reproductive health. My short-term goal is to become a health educator, and my long-term goal is to open up my own non-profit healthcare center. I also hope to donate back to UMBC. Support the UMBC Alumni Scholarships today!